ZEBULON, NC - The Carolina Mudcats, the Class A Advanced affiliate of the Atlanta Braves, proudly announce that starting pitcher Max Povse and relief pitcher Evan Phillips were both named to the 2016 Carolina League All-Star team by the league office on Wednesday afternoon. 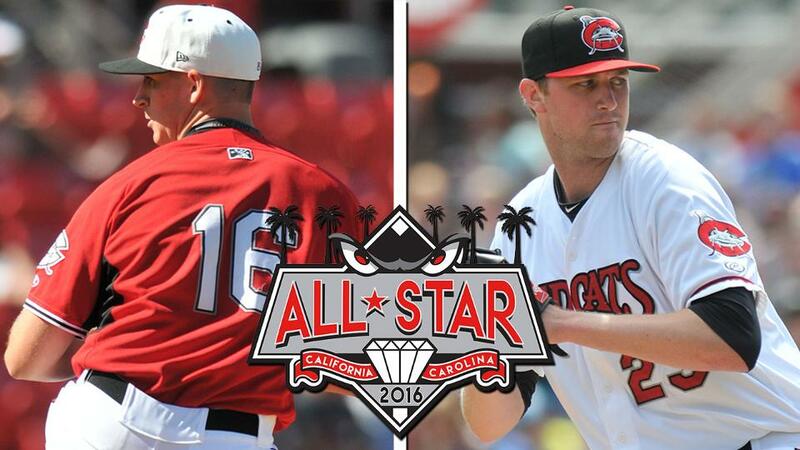 Both Povse and Phillips will travel to Lake Elsinore, CA during the 2016 All-Star break and will represent the Carolina League against the California League All-Stars in this year's annual Carolina-California League All-Star Game. The game will be played at The Diamond, the home of the Lake Elsinore Storm, on Tuesday, June 21. The upcoming All-Star game will celebrate the 75th Anniversary of the California League. Povse attended Green Hope High School and is originally from Cary, NC. The 22 year-old Povse has pitched to 3.55 ERA over 11 starts with the Mudcats this season and was second in the Carolina League in strikeouts with 64 over 63.1 innings pitched at the time of the announcement. He was also second the league in Fielding Independent Pitching (2.55 FIP) and fourth in K/BB ratio (4.57) as of June 8. The Braves selected Povse in the 3rd round of the 2014 Major League Baseball draft out of UNC Greensboro; he is currently in his fourth season as a professional. He recently struck out a career high 10 batters on May 27 versus the Frederick Keys and opened the season on a scoreless innings streak that spanned three games and his first 16.1 innings pitched. Povse earned the first Carolina League Pitcher of the Week award of the 2016 season on April 18 after going 1-0 with a 0.00 ERA over his first two starts of the season (2 GS, 13.0 IP, 4 H, 0 R, 0 ER, 2 BB, 14 SO). Phillips, 21, attended Clayton High School and was drafted by the Braves in the 17th round of the 2015 MLB Draft out of UNC Wilmington and is in just his second season as a professional. He pitched to a stellar 0.82 ERA over 16 games and 22.0 innings pitched before the All-Star nomination announcement this season. Phillips (as of June 8) led Carolina League relievers with a minimum of 20.0 innings pitched in WHIP (0.68) and average against (.105); he was also second in ERA (0.82). Phillips collected two saves and had not allowed a run over his previous six games and eight innings pitched before today's announcement. Povse, Phillips and the Mudcats return to Five County Stadium on Thursday, June 9 for game one of a four game home stand against the Winston-Salem Dash. Tickets are currently available by contacting a front office representative at (919) 269-CATS (2287) or by visiting www.carolinamudcats.com. The Carolina Mudcats are the Class A Advanced affiliate of the Atlanta Braves. First established in 1991, the two-time Southern League Champion Carolina Mudcats are in their 26th consecutive season of baseball at Five County Stadium in Zebulon, N.C.